They’re bright, fun, and glow in the dark, but are they safe? 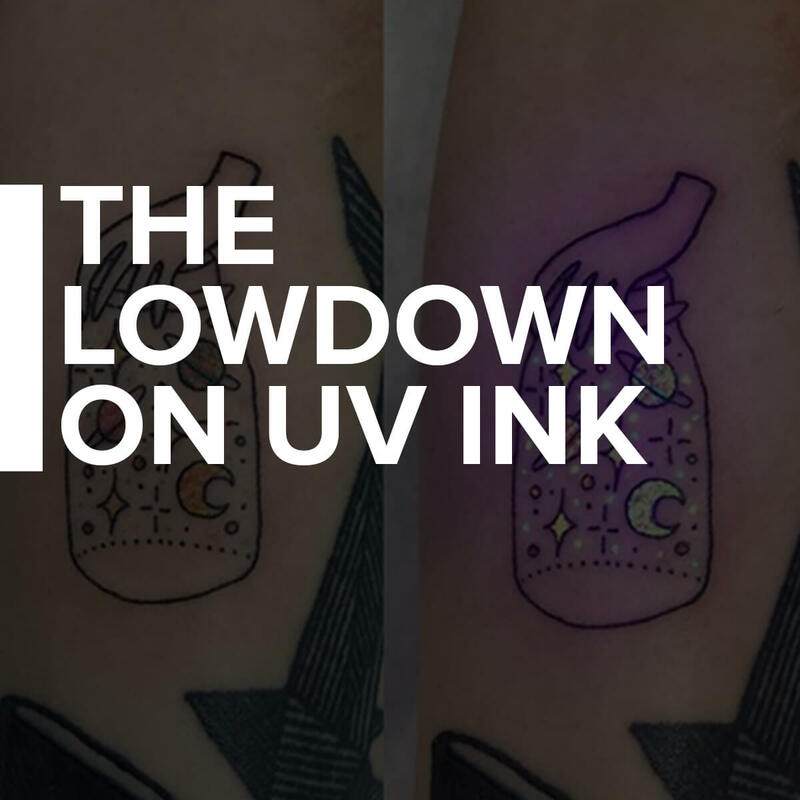 There’s a hell of a lot of misinformation out there when it comes to UV ink tattoos, so we went to the source the set the record straight. We asked a tattoo artist who specializes in blacklight reactive ink tattoos to find out exactly what this kind of tattooing is all about. This is what we learned. The trend of UV ink tattoos can be traced back to the era of neon and raves that is affectionately known as the 1990s. Tattoo artist Indigo explains that this is where the idea that UV ink is dangerous comes from, “…in the 90s, UV styled tattoos were a trend for clubbing [and] raving. At the time, there weren’t enough tattoo brands that could offer safe tattoo inks to use for these tattoos, though. So, it was a 50/50 chance for a lot of people”. During this time, it was risky to get a UV tattoo because there was no knowing what was in the ink used to get that glowing effect, but that’s changed over the past 20-odd years. The UV tattoo trend pops up every couple of years, and it’s gaining popularity once again in 2018. Indigo goes on to say, “fast forward to 2018, the style is slowly coming back, but not too much, as a lot of artists will say, ‘It’s not safe’. Matter of the fact is, those people are uneducated and don’t realize that there’s a whole world out there of tattooing”. Blacklight tattoos aren’t just fun for clubbing nowadays – they’re a great way to add a little something extra to your ink, “I personally love the 90s and everything neon [and] super bright coloured. I love the effect it gives to tattoos, and it’s like the clients ‘little secret’. You would never know the tattoo glows until it’s exposed under blacklight, and then it’s just overall super cool to look at”. There’s also a misconception that this kind of ink is invisible in normal lighting. That’s not always true. As Indigo said, it’s a component of some colors of tattoo ink that can take on this glowing effect, “The ink I use is regular tattoo ink that actually shows up on the skin in regular lighting, but also happens to give off the ‘glow’ effect when exposed to UV lighting”. These neon colors show up both in normal lighting, and under blacklight, where it glows. It’s been misleadingly reported that UV reactive inks aren’t approved or regulated by the FDA, but it’s important to note that not much in the tattoo industry currently is, “Fun fact, regular tattoo inks aren’t even regulated by the FDA, so to say this style of tattooing is unsafe is just ironic”. To say that the unregulated nature of just UV reactive ink specifically is very misleading. This is why it’s so essential to make sure you’re going to a reputable tattoo artist, who follows proper hygiene procedures around tattooing. A tattoo with blacklight reactive ink isn’t much different from any other tattoo, but there are a couple of considerations to take with them. As far as tattoo aftercare, it’s best to give it some extra love, “The only difference I would say to do is to give it extra care. Tattooing with this type of ink can be hard as the ink itself is a bit thick – thicker than regular ink – so I have to pack it in a lot more into the skin”. The result of that creates a sort of 3D effect when it heals, which gives that design an extra visual impact, but you want to make sure you take good care of it as it heals – as with any tattoo, “If there are any problems someone comes into contact with, always ask their doctor for help. Everyone has different reactions to ink, whether it’s regular or UV ink”. Another consideration with the particular kind of ink is how it reacts to different skin tones, “…a concern I have is, will it show up on darker skinned folks? The one thing I try to do is keep a diverse clientele and help everyone as much as possible. I haven’t seen enough photos of this ink used on darker skinner folx, and I think that’s a problem. We see a lack of diversity in the tattoo industry and it has to change”. If you’re in the market for a UV tattoo and you have a dark skin tone, researching artists who have experience tattooing on darker skin will be key. UV ink tattoos are not a new trend, but they are a very misunderstood one. It’s commonly believed that the ink used to achieve the blacklight effect is not safe for use, but that’s not the case. If you go to a reputable tattoo artist to get it done, they’ll have the chemical information for you to see what’s in the tattoo ink itself, and they’ll be using ink from legitimate, professional sources. Getting a UV tattoo doesn’t mean it’s going to be invisible outside of blacklights, rather, it’s often a neon color that will also glow when exposed to blacklight. If you’re a fan of neon, bright colors, or 90s culture, this just might be a tattoo trend for you to look into. Do you have a UV ink tattoo? Let us know in the comments!